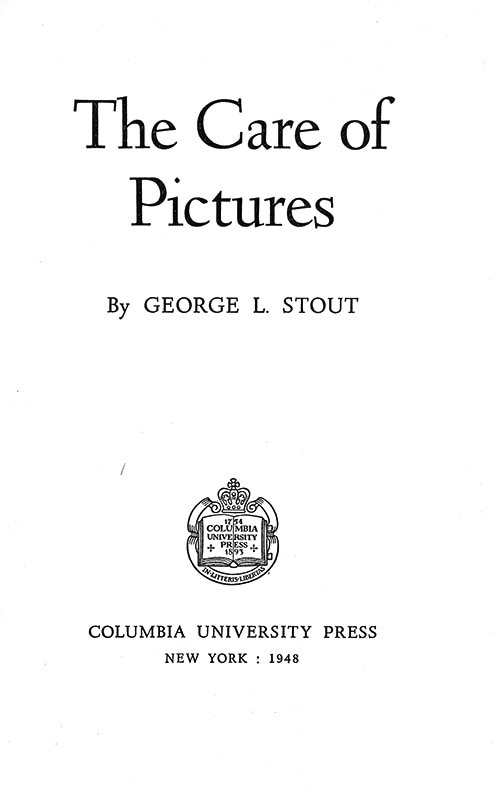 Winterset Iowa native, George Stout attended Grinnell College in Grinnell Iowa and the University of Iowa. He was head of the conservation department at Harvard University's Fogg Art Museum, director of the Worcester Art Museum and Isabella Stewart Gardner Museum in Massachusetts, and a member of the Monuments, Fine Art and Archives (MFAA) Section of the U.S. Army during World War II. His legacy to art conservation is well represented in this article in Harvard Magazine. He publishedThe Care of Pictures in 1948.
flood, war, and from weather and worms and mold. They have been moved on cars pulled by steam, they have been flown in aircraft, hidden a thousand feet below ground, sold for sums that in other days would have bought a kingdom, lighted by energy that flows through wires, recorded by hundreds of photographs, and reproduced on the pages of books. And their designers in other times would have been confounded by the means now taken to preserve those works.